For some players out there, the idea of owning a pair of elite level Predator 18+ boots might just be a dream. The same is true for the top-tier Predator 18.1 and their +$200 price tag. With all the high-tech specs and visual promotion comes a much higher price that just does not provide sustainable value for your everyday player. Something that might be more attainable is the Predator 18.2, a mid-tier style option with a much more affordable price that features similar aesthetics to their big brother. Although they are laced, many questions have come to us about taking the laces out. Can they be worn like the 18+ or would they be too loose? 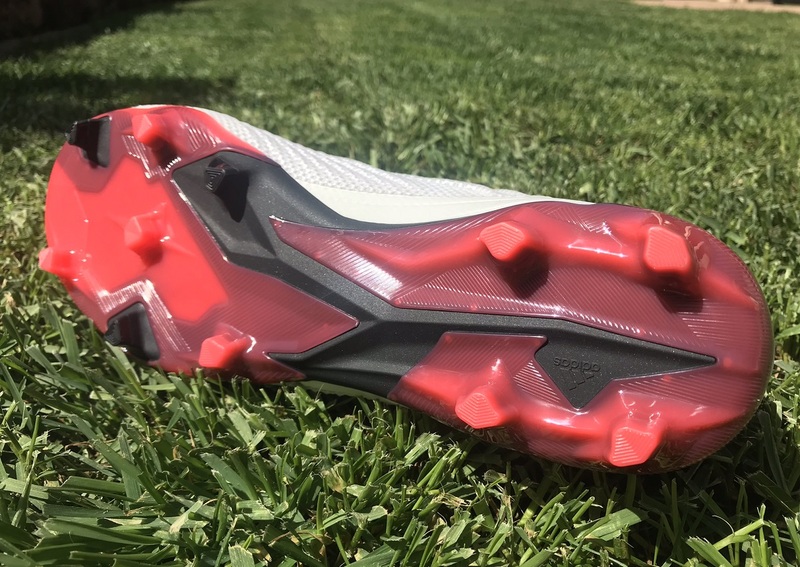 Here is our take on what the Predator 18.2 has on offer, and what players can expect should they decide they are the boot for them. Where Do They Sit In The Predator Silo? At the top of the pyramid is the elite level Predator 18+ ($299) and their laceless design. Then comes the top-tier Predator 18.1 ($225) that is designed from the mold of the 18+, with the extra bonus of laces. 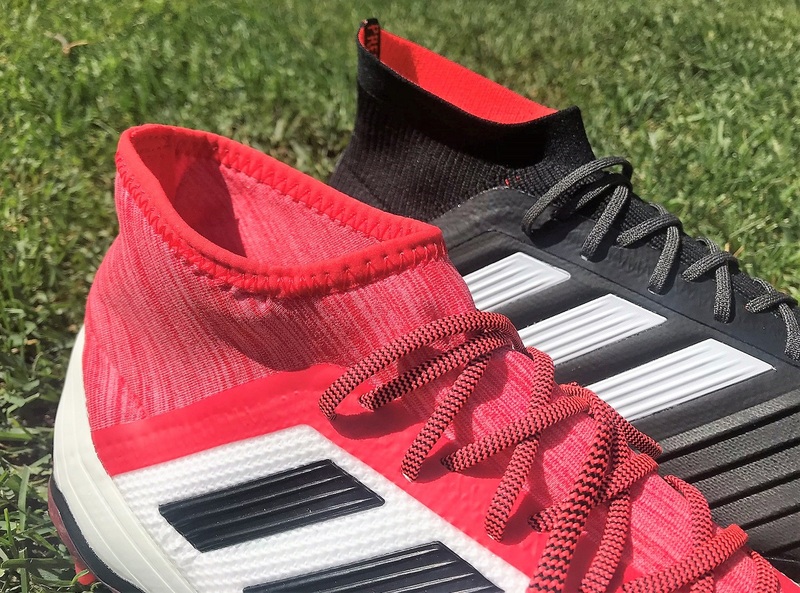 Then comes the mid-tier Predator 18.2 ($140), designed to mimic the 18.1 but with materials that are not as performance driven. A suitable option for players that want something reliable without the burden of an expensive price-tag. I was actually pretty surprised by how efficiently these boots broke in. To the feel, they are a little stiff with the synthetic upper holding a structured shape and plenty of texture. It doesn’t fold much as you push your finger against it. The soleplate is also pretty firm, something I expected to take a few wears to loosen up. First time out, I took them into a training session and ended up wearing them the entire time. They are not the most majestic boot on the market, primarily because they don’t have buttery soft materials you find on higher tier boots, but they feel comfortable on foot and can help you play distraction free. On this version of the Predator, the material used through the collar and tongue is a little looser, with less focus on hugging the ankle. It does offers some compression, but it is the laces the prove vitally important in creating a secure on foot fit. Don’t be surprised if it stretches over time, a lot more than Primeknit does. Visually, the tiered Predator styling across the front of the synthetic upper looks rigid and stiff. Well, it actually is starting out. When you run your fingers along it, there isn’t a lot of give. The added texture that runs through the ControlSkin does play a very valuable role, the concept is to add some additional definition for enhanced control on the boot, with the material having more angles to cushion while also providing a little extra rebound when you are striking shots. Is it like previous Predator boots? Not exactly because it doesn’t rely on an external component to enhance performance. Instead, adidas use manipulation of the upper material to create something Predator-esque. And in my opinion, it works beautifully well. 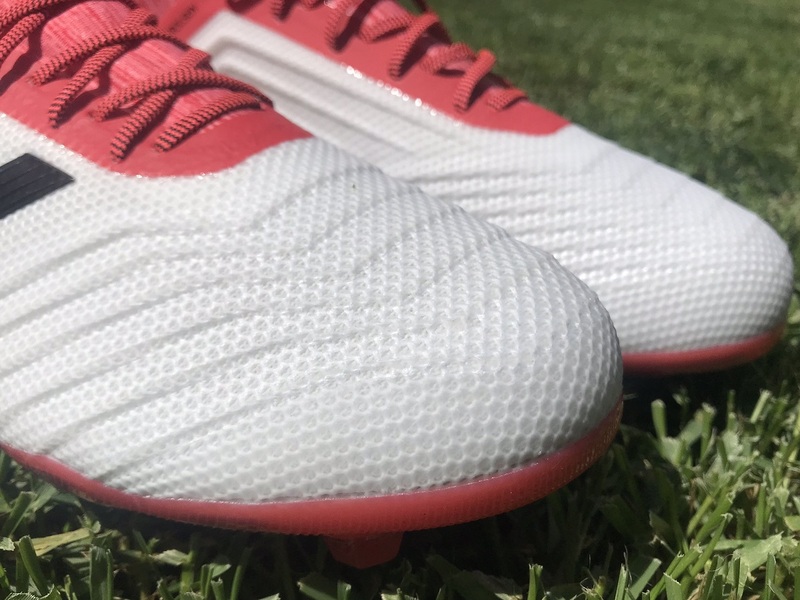 Even though you don’t get a true natural feel on the ball, you are getting some added bite and proficient durability that will allow these to be a boot you wear through an entire season. 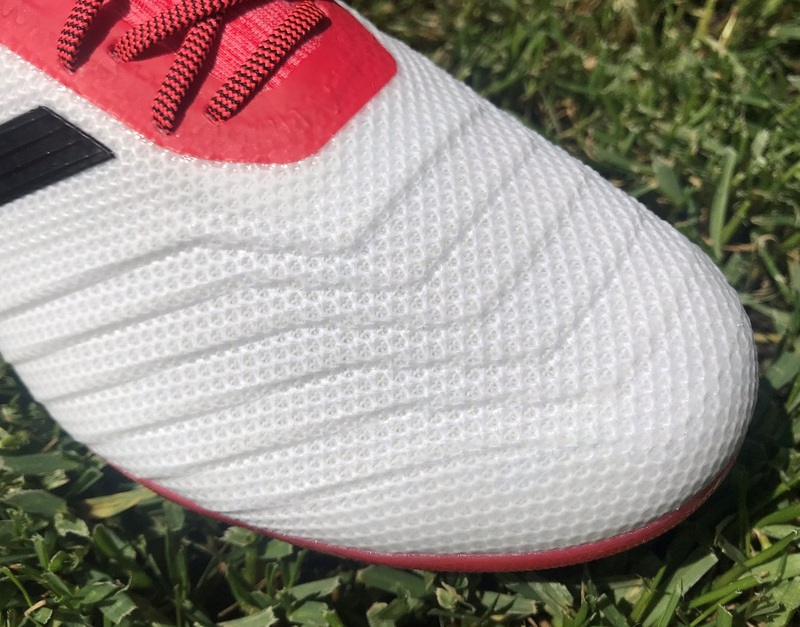 In terms of traction, adidas use the same ControlFrame stud configuration that is found on the Predator 18+. What is a little different here is the omission of a BOOST through the sole. As a result, adidas has to use a thicker material that is heavier, something you can definitely feel underfoot. Don;t get me wrong, it is not like wearing a pair of steel-clad boots that will anchor you to the floor. But after switching from testing the Predator 18+ to the Predator 18.2, I could feel the difference. As far as in-play experience goes, they hold up very well. You get plenty of traction and the ability to cut at speed on both FG and AG surfaces. One of the positives to this boot is how well they hold up on artificial surfaces. But I can confirm there is plenty of bite without any unnecessary drag, and that means firm footing when you need it most. Can You Wear Without Laces? Great question, and this is one I had to try. 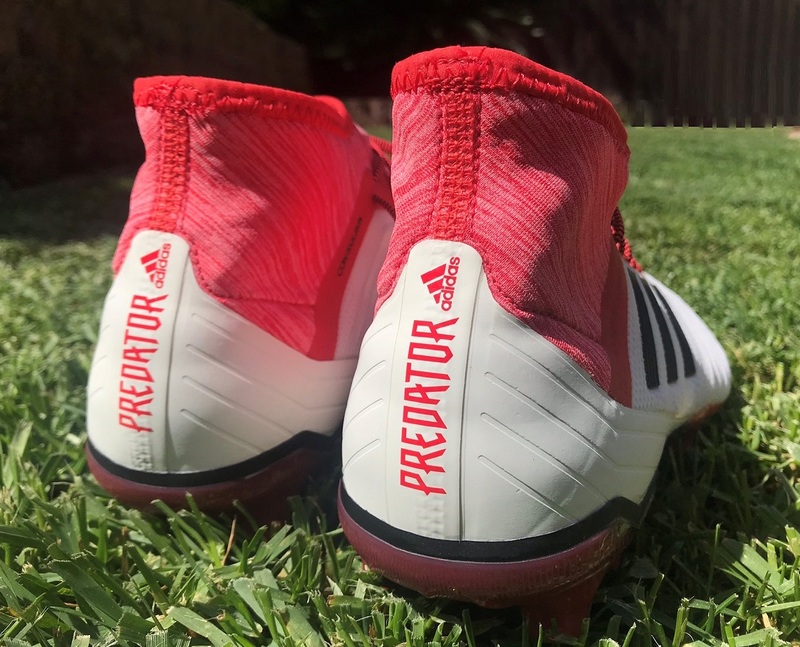 Given the fact they are priced so much lower, couldn’t you just take the laces out and make them look like the Predator 18+? Visually, the answer is a definite yes. But sadly, from a performance perspective they don’t have that snug and secure fit around the ankle you need in order to wear them laceless. 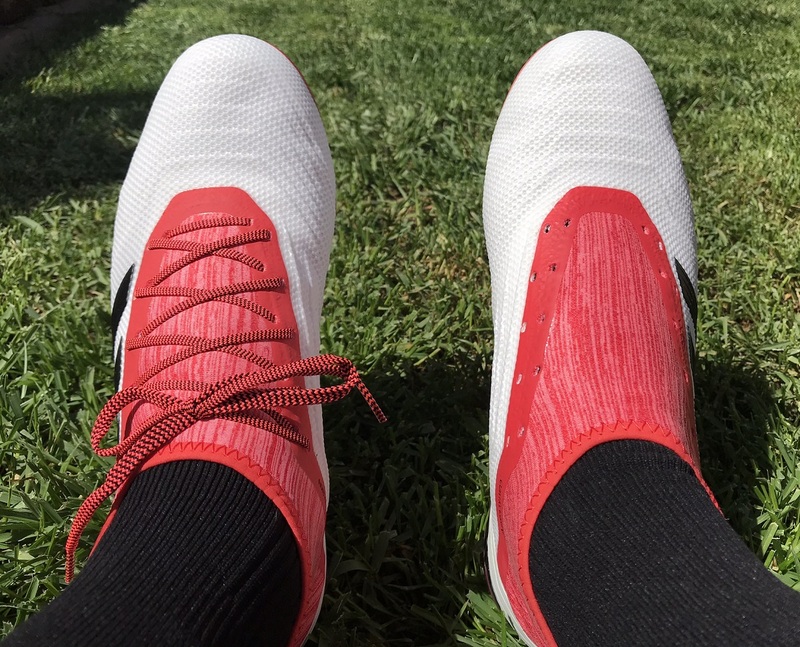 Yes, you can run around without the laces in them and they won’t fall off, but as you start to make cuts and turns, they shift under your feet and are going to compliment your playing style. You can feel your foot wiggle without the added compression of a Primeknit collar. 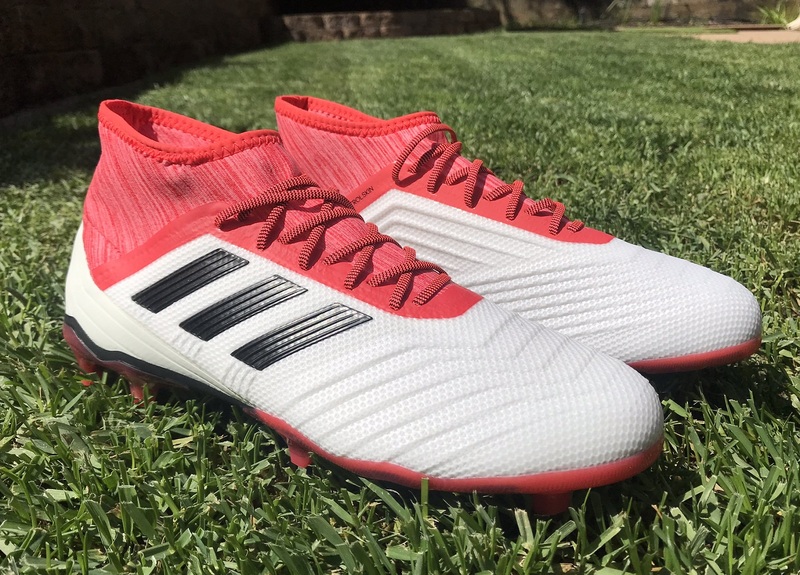 Much the same as other boots in this Predator line-up, they offer an accommodating fit that is sure to suit a variety of players. If you need something that is a little wider through the forefoot, they are definitely an option to consider. Length wise, I actually found them to be just a tad bit longer than I expected they would be, more related to the higher angle cut through the toe. But, there is not enough space to warrant switching sizes. If you need something a little more narrow, they are not ideal. 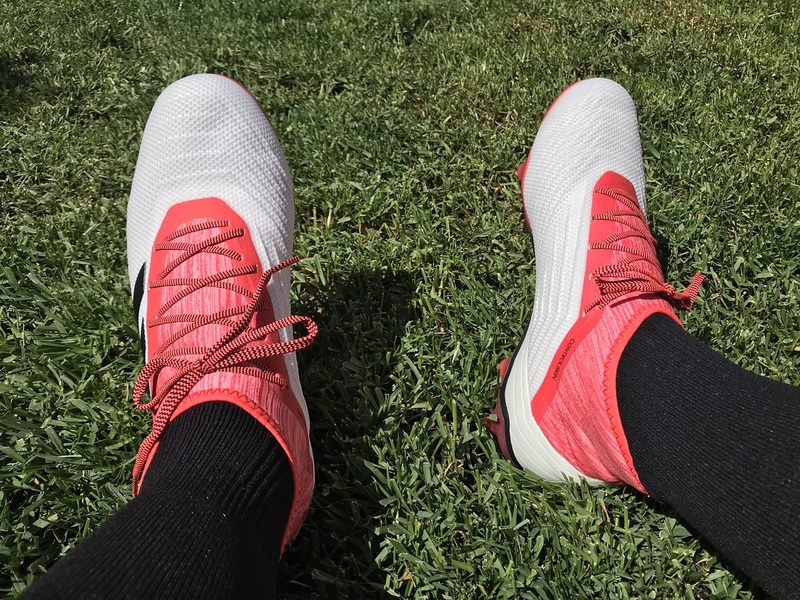 But, you do get a collar that provides some security and keeps your foot in the boot, while the laces add the ability to be able to customize a tighter fit through the midfoot. Again, not ideal but there is something to work with if you can try them on before buying. Realistically, my only gripe is the weight of the boots. At 9.2oz, they are one of the heavier options currently on the market. We have seen brands make strides in keeping the weight of mid-tier options down in the 7-8oz category, so the jump with the Predator is a little surprising. 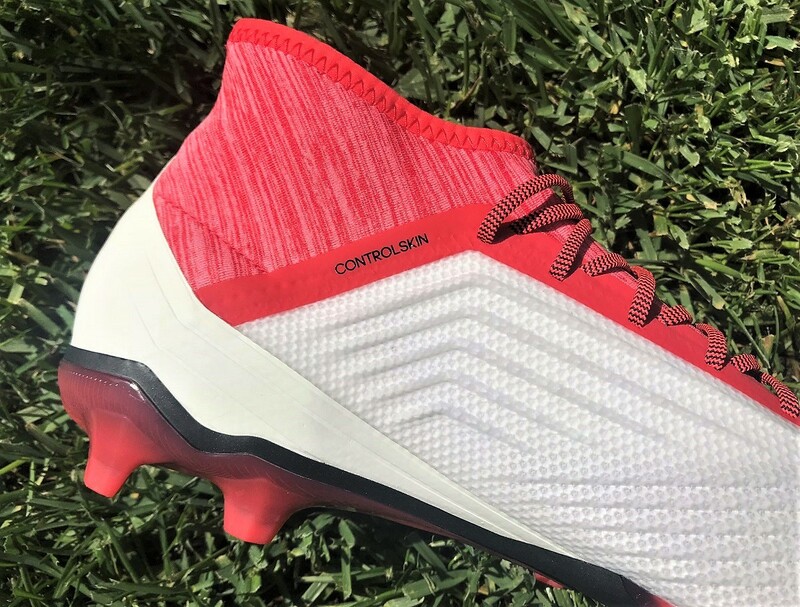 Then again, that enhances durability and players looking to commit to a pair of these are probably looking for reliable performance more than pro level technology. Unfortunately there are not that many options when it comes to 18.2 colorways. Right now, there are just the two as adidas looks to keep things a little more selective. You can either go Cold Blooded White or stick to the more traditional Predator Black. Both have a retail of $139.99 but watch out for sale prices! Highlight: A solid mid-tier option that mimics the laced 18.1 with a tiered Predator zone. A durable and reliable boot in play. Would I Buy Them: They were fun to wear, and I’m a big fan of the fact they held up really well through play. So, they are a longer term option for players that want value for money. But, from a personal perspective there are other mid-tier options I’ve enjoyed more. Player Position: Ideally, these are structured to be a more defensive style boot. 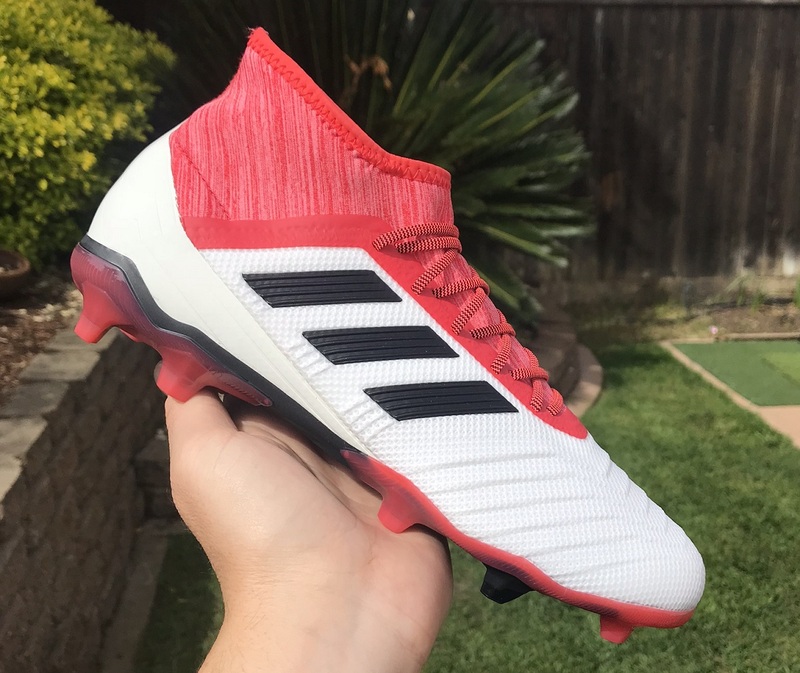 I actually see outside backs really enjoying them, players that play longer passes and want a boot that can provide comfort through wear! Tall, powerful strikers should also definitely take a look at them. I’m in the market for a new pair of boots and this new style with the built in sock thing is everywhere. My question is, what is the durability of that new technology? In my mind, if I play in these kinds of clears long enough, the elasticity of the sock bit would wear out quickly, even more so if they get too wet. So, how do these kinds of boots hold up in the long term? I play twice a week all year round. When I purchase new cleats, I expect them to last for a year or two at a time. Thanks for taking the time to read through this and any and all information is greatly appreciated. I haven't heard a lot of negative feedback from people about the shape/overstretch of collars. The most common concern is that it starts to smell over time, since you are not likely to wash them often. But, with any of the top end releases, you should be able to get a season out of them without the material feeling loose around your ankle. Might be worth playing it safe and choosing the ankle cut version instead.